Orchestra of English Touring Opera / Jonathan Berman. 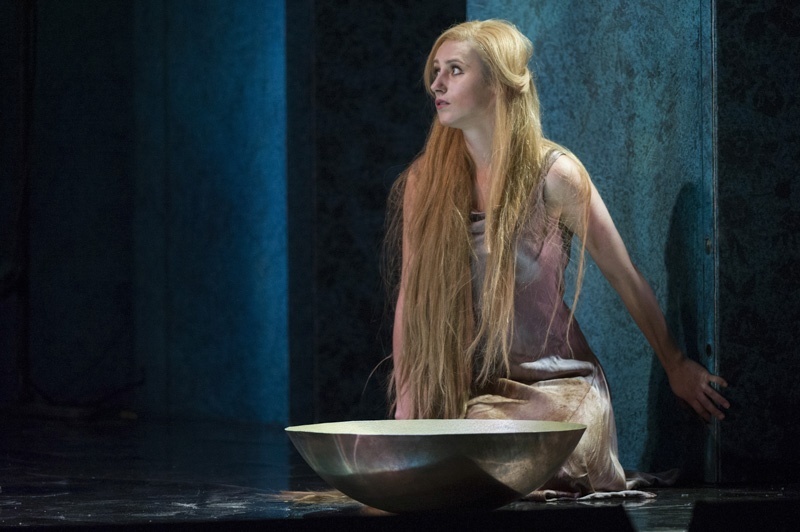 English Touring Opera, Britten Theatre, Royal College of Music, London. Thursday, October 1st, 2015. 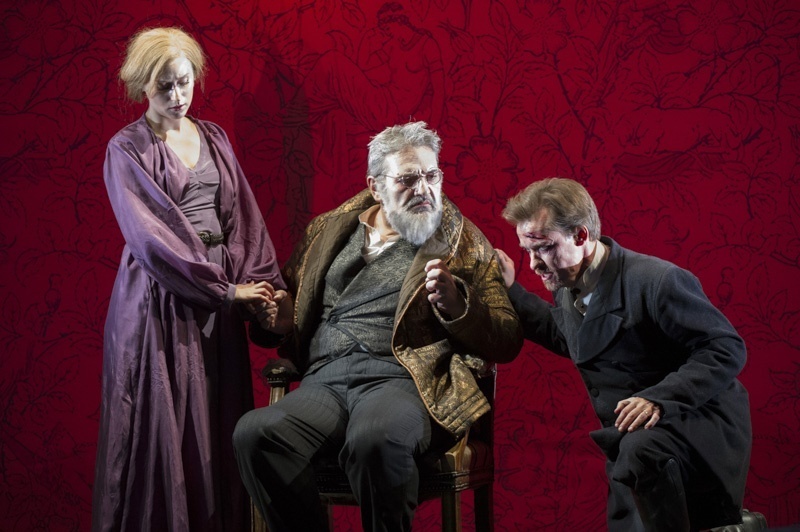 This production of Pelléas et Mélisande is the first show in a set of three French operas that English Touring Opera is touring around England this Fall. In a way, with its relatively small cast and focus on individuals, Pelléas should lend itself well to a chamber treatment. Certainly in this arrangement by Belgian composer Annelies van Parys only once did I miss the full orchestra and that was in the very closing measures of Act 4. Otherwise it’s well orchestrated and she makes highly creative use of the reduced forces. Where it falls down is in the horrific cuts inflicted on the score. We lose two scenes – Act 2 scene 3 and Act 4 scene 3 – as well as several lines throughout the work. For instance, Pelléas’ first entry when describing what had happened to his ‘ami Marcellus’ is completely removed which means Pelléas does not sing at all until Act 1 scene 3. Lines are pulled and trimmed seemingly at random and we are never given an inclination of why Pelléas needs to leave and the inner conflict he has between saying farewell to his friend, his sick father and his relationship (in whatever form that might take) with Mélisande. The cuts do in fact feel barbarous. 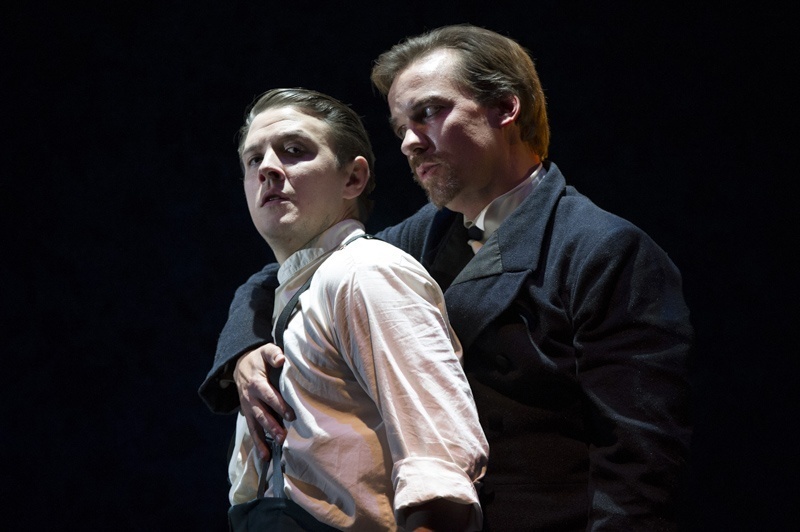 Ultimately, it’s regrettable because the piece lends itself to an intimate staging such as this and the small theatre brought home the claustrophobic atmosphere of Allemonde. It was brave of ETO to perform the work in French with an almost entirely Anglophone cast. Certainly the words were clear for the most part even if some of the pronunciation was distinctively Anglophone in flavour. It was infinitely better than the Royal Opera’s recent completely incomprehensible Dialogues des carmélites. Jonathan Berman’s conducting was fluid and alive. He gave his singers enough room to get the words out but also kept the tempi flowing to compensate for the reduced weight in the orchestra. The orchestra played decently enough although some of the string intonation was a little on the raw side. The singing was more than decent. 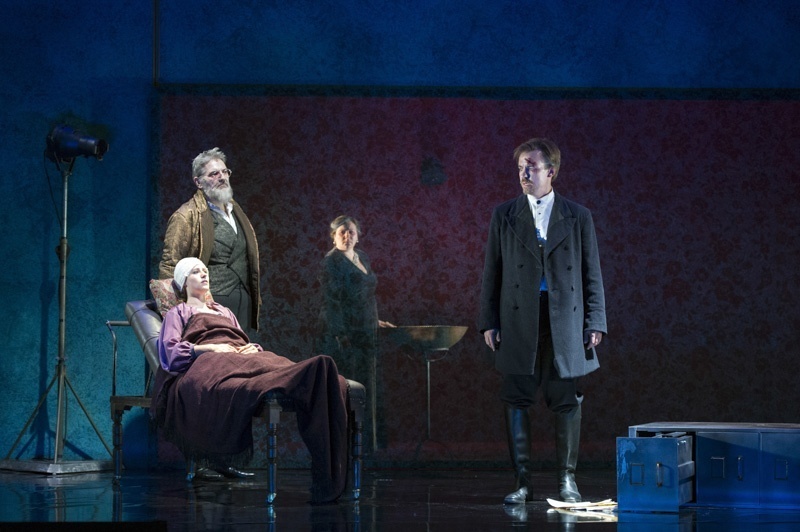 Stephan Loges was a striking Golaud, using his instrument to shade the character’s progression from uptight stranger to broken father and husband. The voice frayed in the higher reaches but Loges used this sensitively to fully bring home the impact of Golaud’s journey. Michael Druiett’s Arkel was sung with the stillness and gravitas that the role requires although his use of the text could have been sharper. Helen Johnson’s Geneviève sang her role in a fruity contralto, happiest in the lower ranges of the part. Lauren Zolezzi’s Yniold lost much of his music but made an impression due to the purity of her sound – indeed, I’d like to hear her as Mélisande one day. Any performance of this most enigmatic of works lives through the performances of its titular characters. Susanna Hurrell was a less enigmatic Mélisande than most. The voice was full with a rich vibrato. She had clearly fully mastered the score and had worked hard on the words. I’m not sure whether it was her interpretation of the role or the director’s but I found her more of a flesh and blood character than other interpreters of the role I have seen. She was clearly a woman in control of her own destiny and a lot stronger than the text might suggest. I also felt that there was little sense of her pregnancy. It’s an interesting reading and I’m glad to have seen it though I’m not convinced it completely worked. I first heard Jonathan McGovern in a recital at the Wigmore Hall last year. At that time, I remarked that I would love to hear him sing Pelléas and the promise that he demonstrated in that recital was here more than fully realized. 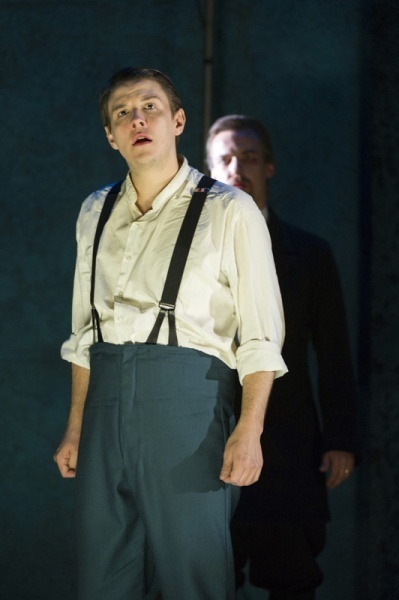 He has an ideal voice for the part – a youthful high baritone with a phenomenal top. He also has a good line and the vocal colours he uses are ideally matched the music and textures. The way the voice opened up at ‘on dirait que ta voix a passé sur la mer au printemps’ in Act 4 really was a thing of wonder, pouring out repeated ecstatic high G-sharps. He is already a very good Pelléas. I would just like to hear him savour the words more and there are also some diphthongs that could be sharpened up slightly. The role really could have been written for him and there is genuine potential here. If he can tighten up the diphthongs and make more of the text he could be a truly great Pelléas. I look forward to seeing him grow in the role. James Conway’s utilitarian staging did the job nicely enough though some stage business with a piece of office equipment looked slightly out of place. It created and maintained a clear narrative and was very much about flesh and blood characters. In a work such as this that trades on its enigmas, perhaps Conway’s staging was ultimately too much of this world. That said, it certainly provided a useful framework for the action. This Pelléas is never less than honestly sung and clearly has been well prepared. Where it falls down is in how much of the text has been removed and how we subsequently have lost several aspects of the narrative as a result. I am glad to have seen it and it’s testament to ETO’s ambition that they can pull this off. It also introduces us to a major new interpreter of the title role, someone who certainly has the potential to be one of the leading interpreters of this wonderful part.